Firstly there was the cushion we made using the Create-a-tilt ruler from Sewing Revolution. It was lots of fun to do. We're going on to make a lap quilt for our next project using the same ruler. Then there was the book cover. We used fabric folding to complete this. Still have some beading to do at the bottom as I didn't quite centre the "smocking" in the middle. It looks a little wonky as the book wasn't in it. When I get the beading done, I'll take another photo. First two blocks with borders for my second and green version of 'Tis the Season. I'm trying to decide whether I stay with these two borders or try to add others. Haven't had a chance to put some other greens next to them to trial. Now it's off to Sound of Music Rehearsals for this afternoon. 4th son turned 12 on Friday - had a successful party in the park for him. A bit nerve racking as we agreed on 6 friends being invited and that number grew and when we actually got to the park I wasn't sure how many to expect. It all worked out! Yesterday was the last game of rugby for our boys for this season. Not the best of seasons through injury and never really enough players, but they came together as a team and they were playing much better rugby by the last game. See what happens next year. I'll get some more photos up later. Great projects - love that cushion, love the tilt to it. 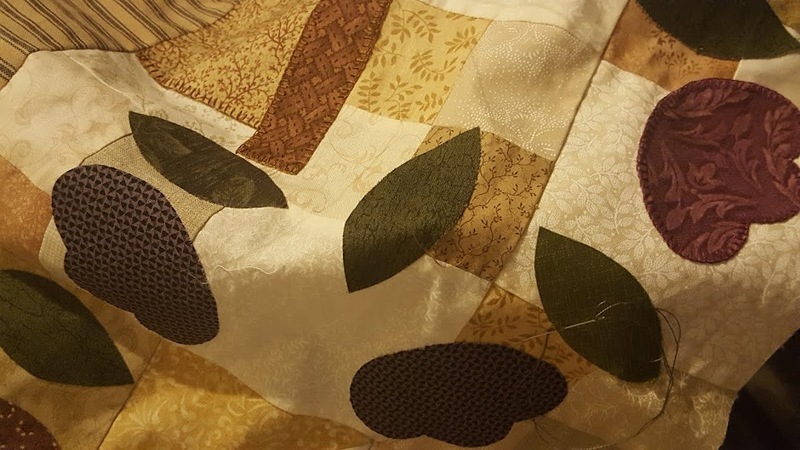 The fabric folding is gorgeous and I love your blocks! I seen same those book cover in one of the bargaining market. It looks beautiful to use as a tv cover or dinning table also.